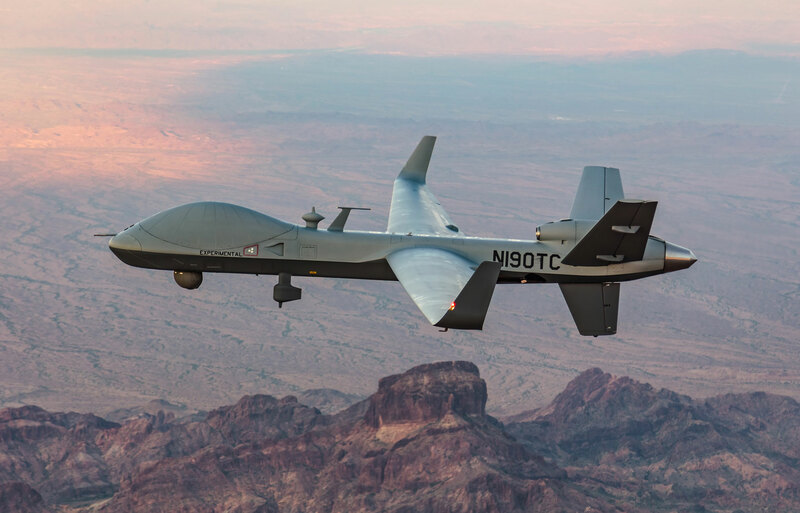 The first transatlantic flight of a remotely piloted aircraft (RPA) is planned for July 10-11 by General Atomics Aeronautical Systems (GA-ASI). The company will fly its MQ-9B SkyGuardian RPA from Grand Forks, North Dakota, to RAF Fairford in southern England. It will then go on display at the Royal International Air Tattoo (RIAT) from July 13 to 15. The flight will take more than 20 hours. GA-ASI will use Inmarsat’s SwiftBroadband satcom to control the RPA from a ground station located at Grand Forks. The company has been developing the SkyGuardian as a certifiable RPA that can fly in controlled airspace. This will, therefore, be a milestone demonstration, although GA-ASI has already controlled the MQ-9B from takeoff to landing elsewhere, from a single ground station in the U.S. “Type­ certification, together with an extensively tested collision avoidance system, will allow unrestricted operations in all classes of civil airspace,” GA-ASI claimed. In a statement, RIAT said, “The UK Civil Aviation Authority [CAA] has approved SkyGuardian’s flight in UK airspace and has issued guidance to pilots and aircraft operators to take note of a series of airspace restrictions that will be put in place over certain areas of the UK to ensure its safe journey.” The UK Ministry of Defence (MoD) noted that this would be the first time that an RPA has entered UK airspace under beyond-line-of-sight (BLOS) control. The UK Royal Air Force is the launch customer for the MQ-9B, and RIAT is a key event in the service’s 100th birthday celebration this year. Linden Blue, CEO of GA-ASI, said his company is “proud to have supported the RAF over the past decade with our MQ­-9 Reaper. We believe that this flight is an appropriate way to celebrate the RAF’s position as a leader in innovation.” In RAF service, the MQ-9B will be named the Protector. Last month, GA-ASI staged demonstrations of a Guardian RPA from Iki island airport in Japan. In 10 test flights that each lasted five hours, the company sought to demonstrate civil and scientific applications of an RPA including meteorological, disaster, and oceanic observations; rescue support to marine accidents; and other tasks. The data that was collected is being shared with multiple Japanese government agencies. The UK MoD also noted that the RAF’s forthcoming Protector fleet could provide military aid to civilian authorities.